WASHINGTON -- United Launch Alliance is seeking funding from NASA this year to finish designing a key safety system for potential commercial crew launches on its Atlas and Delta rocket fleet, officials said last week. 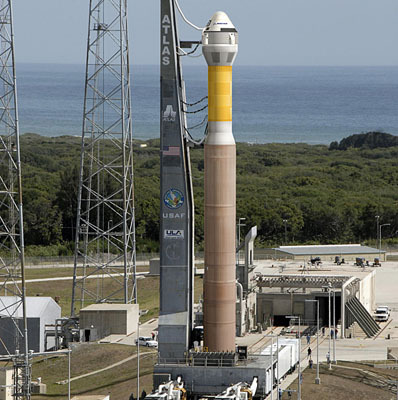 The company is human-rating the Atlas 5 and Delta 4 rockets to launch astronauts inside privately-built spacecraft. NASA is partnering with ULA and spacecraft builders to carry U.S. astronauts into orbit by 2015. After receiving $6.7 million from NASA last year, ULA kicked off the design of a health-monitoring computer to identify rocket failures in time to save crews. George Sowers, ULA's vice president of business development, said the company developed a prototype Emergency Detection System last year and tested the design in a high-fidelity simulation lab in Denver. "Most of our spacecraft are talking 2014 at the earliest for crewed flight, so we're trying to protect that 2014 date," Sowers said. ULA is revamping its existing rockets to launch commercial manned payloads. Boeing and Sierra Nevada Corp. have already issued subcontracts to ULA to begin studying how to launch their proposed spacecraft. Boeing is designing a seven-person capsule named the CST-100, and Sierra Nevada is working on a lifting body space plane called the Dream Chaser. Orbital Sciences Corp. is also interested in launching its proposed Prometheus space plane on an Atlas 5 rocket. Sowers said ULA is working with every potential spacecraft provider except for SpaceX, which plans to launch the manned Dragon capsule on its own Falcon 9 rocket. 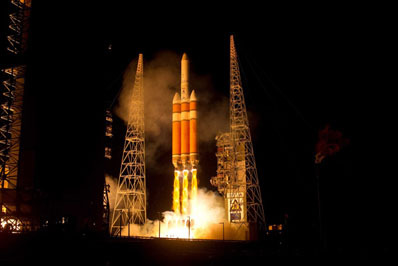 Orbital and Boeing claim their spacecraft will be ready to launch by 2015. Sierra Nevada says 2014 is the earliest the Dream Chaser will be operational. Speaking to commercial space pioneers and executives assembled here Thursday, ULA's top executive called for advancing the availability of all commercial transportation systems to 2014. "I think we need to stretch our goals to have commercial crew service operating by 2014," said Michael Gass, ULA's president and CEO. Gass said ULA will be ready to meet that schedule. ULA officials do not expect making any major changes to the Atlas 5 and Delta 4 rockets, which have amassed a combined 38 flights and enjoy a reliable track record. The EDS is the most significant modification required for either launch vehicle, Sowers said. "We think the rocket we already have will meet NASA's requirements," Sowers said. "We haven't proven that yet. We have to go through that process with NASA and do all the certification." Changes to ground infrastructure might be needed to accommodate a higher flight rate and give crews access to board their spacecraft. The most likely manned payload for the Delta 4 rocket will be the government-owned Orion capsule. Now considered to be a space station lifeboat and potential deep space exploration vehicle, the Orion could launch atop Delta boosters from modified space shuttle facilities at the Kennedy Space Center. Commercial operators are gravitating toward the Atlas 5, which ULA hopes to keep flying from launch pad 41, the home of its unmanned satellite missions. The EDS is the centerpiece of ULA's commercial crew program, which encompasses about 40 employees. "The Emergency Detection System, just like its name says, is there to perceive an emergency with the rocket," Sowers said. "It sends a command to the spacecraft, which would initiate the launch abort system." Spending a mix of private and public funds, ULA developed and demonstrated prototype EDS crew displays monitored by NASA mission control teams during a real Atlas 5 launch in August. The EDS passed a major milestone Dec. 8 with an abort demonstration inside ULA's simulation lab, a computer-controlled system that gauges how systems respond to failures. ULA announced the milestone this week in conjunction with the FAA Commercial Space Transportation conference here. The Dec. 8 demo included four failure scenarios, including a fast- and slow-developing anomaly in Atlas 5's first and second stages. "It's fun to do these simulated failures," Sowers said. "We haven't had an Atlas failure since 1993, and in one day we had four simulated fast and slow failure modes in the first and second stage phases of flights -- a fast failure being something like sudden loss of thrust and a slow failure being something like a degradation of pressure. The system was able to detect all four of those failures and abort in time." ULA is partnering with NASA and other firms to usher in an era of commercial space travel. After the retirement of the space shuttle, NASA plans to move away from government-run space transportation and purchase services from industry. "I think we can easily beat the objective of providing crew and cargo support to the space station for less than 50 percent of the cost of the shuttle," Gass said. NASA is investing in private partners with the Commercial Crew Development, or CCDev, program to provide government funds to companies designing and building human-rated rockets and spacecraft. Last year's $6.7 million award was part of the first round of the CCDev competition. Sowers said private firms are closely looking at launches on the Atlas 5 rocket in its so-called "402" configuration, which features two RL10 upper stage engines and no solid rocket boosters. Engineers can program the Atlas 5 rocket's Russian main engine to throttle, limiting launch accelerations to about four times gravity. Jeff Ashby, a former space shuttle astronaut, strapped into a centrifuge at the National Aerospace Training and Research center in Philadelphia to experience what it would be like to blast off on an Atlas 5 booster. Ashby weathered the ride well, offering design inputs on the placement of checklists, control panels and switches in the cockpit of commercial vehicles. NASA approved an extension of ULA's ongoing work through April, several months later than the development's original end date in December. In the meantime, NASA is on the verge of awarding about $200 million to private companies in the second CCDev competition. The agency expects to announce the CCDev 2 winners in late March. ULA hopes to spend its winnings on further design of the emergency computer, which is about the size of a microwave oven. The company will also seek a supplier to build the EDS, Sowers said. The EDS will have to be put through checkouts to make sure it will survive the launch environment, then ULA plans to put the computer on unmanned rocket launches for flight testing. "Fundamentally, it's about a three-year design and development process," Sowers said. "We've done one year and we need a couple of more years before we actually put it on a rocket."